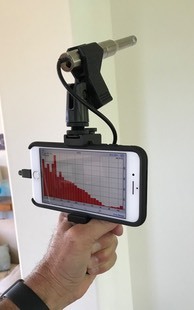 Using inexpensive off-the-shelf parts, it's easy to put together a hand-held Class 1 audio analyzer, using Studio Six Digital equipment and software. 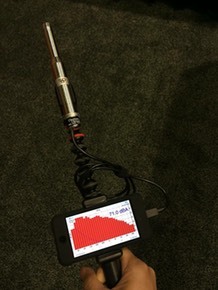 This system can functionally replace many more expensive traditional audio analyzers, that in the past would require either bulky and expensive equipment, or a dedicated computer and audio interface. First, of course, install AudioTools on your iOS device, get either iTestMic2 for Class 2 operation, or iPrecisionMic for Class 1 performance. If required, send the iOS device and iPrecisionMic to the testing lab to get it certified. Next, decide on your configuration. Here are a couple of examples. The one on the left was brought by our booth at the InfoComm show, and the ones on the right we put together from parts that we found on Amazon. It's all metal, which balances iPrecisionMic nicely, and will hold any iPhone model. Here are a list of some of the parts that we found, with links to the product on Amazon. 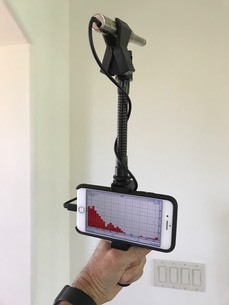 The hand grip also happens to have 1/4-20 threaded hole for a tripod, so this unit would also mount on a camera tripod for more extended operation in one location. If you build one, please send us a picture so that we can share it with others.